Welcome to Techno-Billies: BIG Slippers! This is my latest knitting project. It is a pair of slippers for me. It knits up very quickly - I like that kind of knitting! It is knitted on size 9mm needles which, if you are not a knitter, will mean nothing at all to you, so I have shown them here next to the needles I normally use to knit socks. Everyone has had great fun trying on the finished slipper - it doesn't fit anybody!! Here they are finished (almost finished) beside a pair of my shoes just to illustrate how BIG they are. Do I sound disappointed that I have knitted them so big? Nope! Have I a large beanstalk in the garden perhaps? er... Nope! Here they are inside an old pillowcase and in the washing machine... 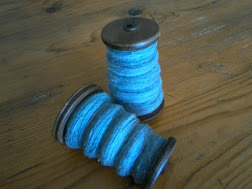 They are knitted in pure wool and I have set the machine for a powerwash at 50C. Do I hear screaming? Fear not, there is a plan afoot, (pun not intended) and even though this is the first time I have ever done this, I am confident of success. (Felted slipper kit bought from here). Labels: Clothes, knitting, What is a Technobilly? What a cracking idea, I would never have thought of that. That's really cool, how clever and they are very funky too!